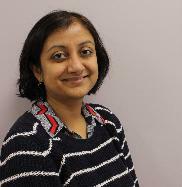 Dr. Shubhasree Banerjee is a board certified rheumatologist who has received numerous awards and recognition for her research in the rheumatology specialty. Dr. Banerjee practices at our Albany location. Dr. Shubhasree Banerjee was board certified in internal medicine by the American Board of Internal Medicine in 2013. In 2016, she became board certified in Rheumatology. She also has a Doctor of Medicine in Biochemistry from the India Institute of Medical Sciences in 2009 and a Bachelor of Medicine and Surgery from The Kolkata Medical College in 2005. • Bielory L, Dutta Choudhury S, McMunn A. Bepotastine besilate for the treatment of pruritus. Expert Opin Pharmacother. 2013 Dec;14 (18):2553-69. • Dutta Choudhury S, Chaudhury AK, Kalra R, Andrabi R, Wig N, Biswas A, Bala M, Luthra K. Antiretroviral drug resistance mutations in the reverse transcriptase gene of HIV-1 isolates from Northern Indian patients: a follow-up study. Arch Virol. 2010 Apr;155 (4):563-9. Epub 2010 Feb 24.